Kumarakom small water world is part of the Kuttanad region. The bird sanctuary here, is spread across 14 acres is a favorite haunt of migratory birds and an ornithologist's paradise. Egrets, darters, herons, teal, waterfowl, cuckoo, wild duck and migratory birds like the Siberian stork that live There in flocks are a fascination for visitors. The best way to watch the birds of the Kumarakom sanctuary is a boat trip round the islands. An enchanting backwater destination, Kumarakom offers visitors many other leisure options. Boating and fishing facilities are available at Kumarakom. 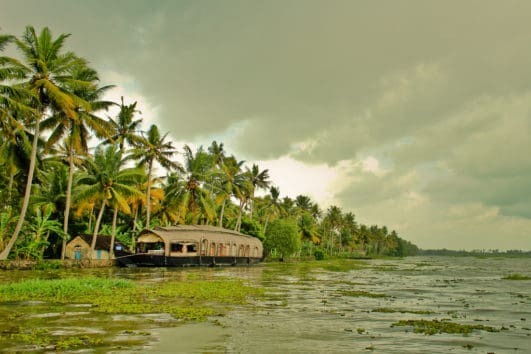 Holiday packages on the houseboats, traditional Kettuvalloms, our an out-of-this-world experience at Kumarakom. An unbelievably beautiful paradise of mangrove forests, emerald green paddy fields and coconut groves interspersed with enchanting waterways and canals adorned with white lilies- this is Kumarakom. A picturesque world of backwaters, thatched houseboats, Cormorants, Chinese fishing nets and swaying palms- An ideal getaway. Kumarakom, located on the Southern coast of India enjoys a well-balanced tropical climate. Nature has composed its magic to perfection here. A million verdant coconut palms lining the rivers lean to examine its reflections on the glassy rivers. Everywhere, nature is at its best. Blooming forth in perfumes of flowers. In the riot of colors of multi-hued birds. This is Kumarakom, one of the world's most talked about destinations. Climate: Kumarakom enjoys a tropical climate almost round the year. There is always a cool, fresh breeze that makes even the warmest months bearable. The monsoons are from early June to mid August. November through March are considered the best months.